You’ve worked to make your email clear, and you’ve carefully edited to streamline your writing. The body of your email might well be perfect, but it can all go awry if you use the wrong sign-off. It’s just a word or a short phrase, followed by your signature, and yet finding the right tone to close your email often requires a surprising amount of thought and finesse. When you’re struggling with how to end an email, it’s best to consider the context. What works for a friend or close colleague won’t work in a strictly professional correspondence with a distant acquaintance or someone you’ve never met before. Here’s a rundown of some of the most common email settings and the tried-and-true sign-offs that work best for each. Yes, it’s a bit stodgy, but it works in professional emails precisely because there’s nothing unexpected or remarkable about it. Are you writing a cover letter? Sincerely conveys the right tone for formal correspondence. Keep in mind that it’s likely to come off as stuffy in more casual business emails. A good blend of friendliness and formality makes this sign-off a safe bet, but be aware of its greeting-card vibe and use it only when it fits well with the tone of your email. A recent study by the email app Boomerang rated cheers as the most likely sign-off (that isn’t a thank-you) to get an email response. It works well if your email is friendly and conversational but, unless you’re actually British or Australian, it may come off as affected in more formal settings. Cheers, mate! Best conveys best wishes in a cheerful, pithy way. If you get a lot of email, you know that nearly everyone uses this sign-off. That familiarity makes it seamless in the same way that regards is seamless in more formal emails. The downside is that it can be safe and dull, especially if you want your message to be dynamic and attention-getting. This is a fine choice for people you’ve built an ongoing working relationship with. It reassures your contact that things are as good between you as they’ve ever been. According to the Boomerang study, emails that include thanks in advance have the highest response rate. Maybe it’s because this sign-off expresses gratitude but also sets an expectation—you’re saying that you’ll be grateful when (not if) the person you’re emailing comes through. In more formal circumstances, thanking someone in advance may come across as too demanding, so take care where you use it. There’s never really a wrong time to express appreciation when someone has helped you out. I have a friend who once accidentally signed an office email to his entire department with love. He never lived it down. Save this one for family, close friends, and your significant other. The same applies to hugs or XOXO. You’re not thirteen, and this isn’t a conversation happening in a messaging app. Use your words. Do you really, truly belong to the recipient? Nope. This sounds insincere and hokey . . . unless you’re writing a letter home to your parents from summer camp. This one’s okay if you’re sending a formal missive to the POTUS, but it’s too formal for anything else. In fact, according to Business Insider, respectfully yours is the standard close for addressing government officials and clergy. 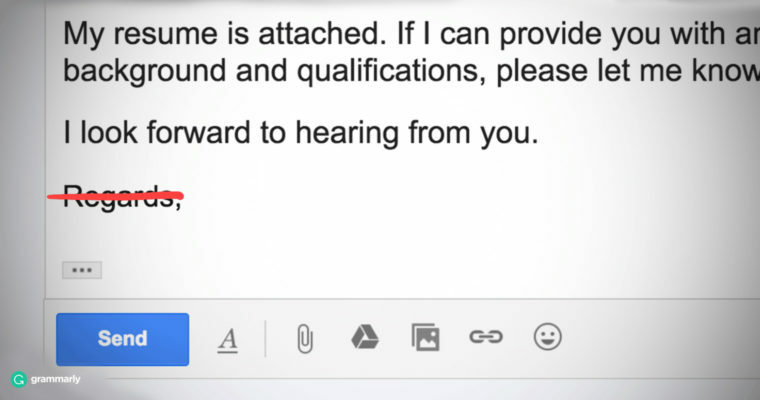 While this sort of sign-off may work for very brief, informal emails, it’s too cold and detached for most, particularly when you’re connecting with the recipient for the first time. It’s best to keep anything with religious overtones out of your professional correspondence, although this one’s fine if you’re emailing an acquaintance about what you’re bringing to the church potluck. Although this sign-off tends to happen more by default when the sender forgets to add an actual signature, we thought it was worth mentioning the ubiquitous . . . This may be the most common sign-off of them all. It has merits, of course. It explains away brevity and typos—who’s at their best when typing on a phone? But it also conveys that you don’t care enough to do away with the default email signature that came stock with your device’s email app. Sent from my mobile. Fingers big. Keyboard small. What’s your favorite email sign-off? Do you have a quirky or effective signature you’d like to share? Let us know in the comments.